Work with floating point images. It’s import to work in floating point (otherwise the Log to Lin to Log operation will degrade the image). When using 10bit dpx files I ‘promote’ the image to 16bit float in the Loader tool. I tend to work with 10bit DPX files in camera’s color space.This example is from a Sony F35 camera so the files are stored in ‘Sony S-Log’. I find it helpful to set the loader to ‘Bypass the conversion’ so that I can compare the Raw image at the beginning and end of the flow. Composite in linear color space and use a viewer LUT to check the work. To convert from linear color in the flow editor to a sensible color space for your monitor, simply use the Gamut view LUT with these settings. In the image above, the color sampler over the light fitting shows super white values ( >1.0). Care needs to be taken so that super whites aren’t accidentally clipped by composite operations. There is detail there that should be preserved even if it can’t be seen in the fusion display view. Two saver tools: one for sRGB preview movies, and one for log DPX files. I DON’T want to accidentally give the director washed out Log files to preview. I DO want to make sure I’ve properly reversed the Log to Lin process with the DPX files I’m creating. The Preview movie is normally at half res for online review. 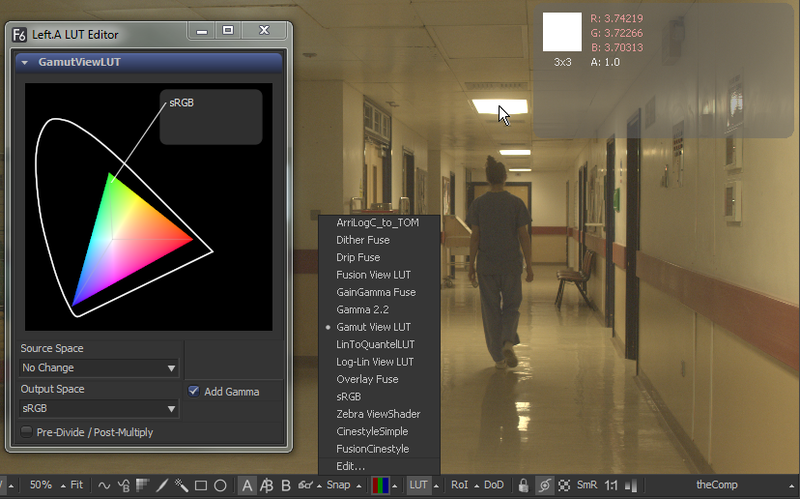 I use a Gamut tool to take care of the ‘Lin to sRGB’ conversion. Make sure to check ‘add gamma’ which should be on by default. Codecs for movie files are a matter of taste. But bear in mind that if someone’s reviewing your work on an iPad then they will need an h264 .mp4 file. There’s nothing special about the DPX file output. I’m just making sure that I’ve correctly reversed the Log to Lin operation. Because the Loader and the Saver are set to bypass it means I can A/B the raw data if I want to. This is a great setup for most work… but if I’m working with hot glows, Flame FX, or lens flares, I’ll try and use a LUT file from the Grading Artist responsible for the show. Otherwise all my lovely detail could be crushed flat to white by the grading process. Working with a LUT from a colorist requires a different setup that I cover in detail here. To find out more there are several good online articles. Stefan Ihringer has written some good in depth articles on Log to Lin workflows in fusion. Linear and Gamma color spaces are also covered by this article Color Space 101. 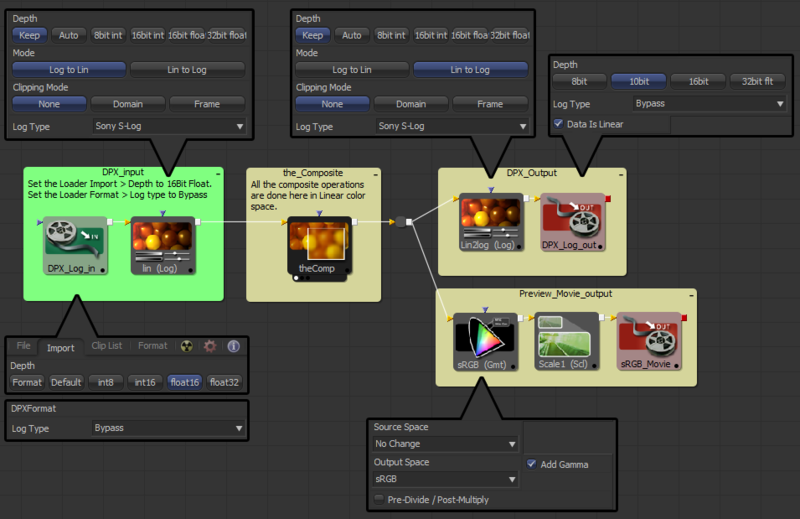 Lastly here’s a technical article on how to emulate the current color management practice at Sony Imageworks.